← P.S. – Light a Match or Something! Years ago, when S was six, she desperately wanted to help her older brother. He had hurt himself and S. was insisting on nursing his injuries. Her 11-year-old brother obviously had little faith in her medical skills and wouldn’t let S near him. So S wrote her big brother a persuasive note. "Why do you never believe me. I believe you so why do you not believe me. And I love you. From S."
Except that song is now stuck in my head. 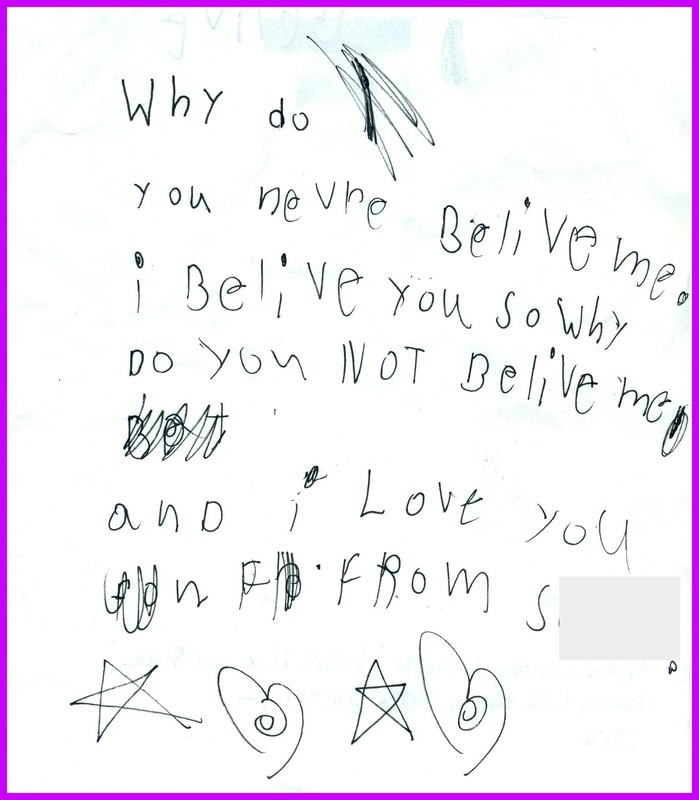 Thanks to S’s mom who submitted this note from her archives. Please go visit her blog at Art Club Blog. Please look through your own archives and send submissions of funny stuff that kids write to stuffkidswrite(at)gmail(dot)com. Posted on February 28, 2012, in Notes and tagged Art Club Blog, Chase McFadden, funny kids writing, Leanne Shirtliffe, parenting, Stuff Kids Write. Bookmark the permalink. 6 Comments. Most 6 year-olds I know (including mine) have over-inflated egos. I don’t blame the big brother. Kids handwriting just never stops being funny. So funny! This is my new favorite website! This blog is great. I use to work at a summer camp and kids really do say and do the best thing.